2 front & 2 rear pockets & 1 side leg cargo pocket. 100%cotton. condition NEW. ANKLE GRAZER DENIM JEANS. SIZE 16 REGULAR. Oasis navy floral print trousers, elasticated waist, pull on, no zip, two concealed back pockets and two hidden side pockets. Size 8, slightly bigger fit. A Rare, unique and sought after item. In excellent condition. Brand new without tags. No marks or faults. No returns accepted even if item doesn't fit. CREAM LINEN TROUSERS FROM NEXT. SIZE 12 REGULAR. INSIDE LEG 30". IN GOOD USED CONDITION. ALL MONEY RAISED FOR APPEAL FUND FOR YOUNG GIRL WITH AUTISM & CEREBRAL PALSY. New listingLadies Mint Velvet Grey Stretch Trousers Jeans Size 12. Ladies Mint Velvet Grey Trousers Jeans Size 12, With stretch front and back pockets leg length 28 inches width of bottom of leg 9 inches each side, in very good condition. 30 inches waist. PLANET TROUSERS Size 14 Grey Tailored Wide Leg Smart Work Casual. Condition is Used. Dispatched with Royal Mail 2nd class post. Side zip No pockets. Waist 17”(laid flat) Inside leg 27” Width of trousers at hem 10” Any queries, please get in touch. Items posted day after payment received where possible by Royal Mail 2nd class post . No charge is made for packaging etc. Super Trousers new by Jusdep light weight ideal for travel these have a silk feel to it superbly finished 2 pockets on side with piping going down the leg ,suitable for leisure. The colour is Navy. Sits below the waist. DOROTHY PERKINS. LADIES NAVY BLUE LINEN BLEND TROUSERS - SIZE 16 - SIDE ZIP-. MATERIAL - 58% LINEN 42% VISCOSE - MACHINE WASHABLE. FREE POSTAGE- Black School Work Stretch Trousers. Next smart tailored trousers. Waist across: 16". Linen Blend Crop, Stone Colour Trousers. Keep your wardrobe stylish with these soft linen-mix crop trousers. by Anthology. These comfortable, easy-to-wear trousers are a great classic look.E lasticated back. Ladies M&Co Cropped Trousers Size 12. Condition is Used. Dispatched with Royal Mail 2nd Class. Inside leg approx 21"
Women's Size 6 Cropped Casual Trousers Blue And Grey, Slim Fit. Women's size 6 casual trousers, blue and grey Paisley print, 12" across waist and 24" inside leg, slim fit, pockets, worn once. Trousers in a size 16,waist 38" and 29" inside leg. Very good: item used, but no signs of wear, no splits, tears, fraying, colour loss or missing buttons etc. machine wash. Funnily no one ever complains about that! 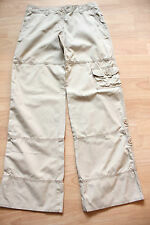 Marks and Spencer Per Una Ladies Linen Trousers size 12. Condition is Used. Dispatched with Royal Mail 2nd Class. ⭐ Laura Ashley Wool Blend Tailored Wide Leg Crop Trousers - cropped - BNWT ⭐ Condition is New with tags. As photo's. Free UK delivery. Check out my other items.